Barry (Grant Gustin) is holding Iris (Candice Patton) in his arms. On the roof, Joe (Jesse L. Martin) slinks down in despair. H.R. (Tom Cavanagh) grabs his gun to take a shot at Savitar, but he has already left. Iris isn’t quite dead yet and she calls Barry, ‘B.A’. On the rooftop, H.R. calls Joe, ‘Dad’. What is going on here? H.R. took Iris’ place! He used the transmogrifier Barry used in the last episode to change his features into Iris’, and to change Iris’ features into his. Using the piece of Savitar’s armor they had, H.R. used it to find Iris. They take off to escape, but are nearly caught. He changed his looks into Iris and Iris looks in his. Iris somehow was knocked out, so as Iris he convinced Savitar not to kill H.R. Tracy (Anne Dudek) was sad that Iris was killed, she is devastated to learn H.R. took her place. Tracy: “Why are you doing this?” H.R. : “I couldn’t be a coward. I’m not a coward.” Killer Frost (Danielle Panabaker) is ready to kill Cisco (Carlos Valdes) but Savitar stops her. He needs Cisco alive to build something for him. He gets a flash and suddenly realizes that Iris is still alive and that he killed H.R. When Barry, Iris, and Joe go to the time vault in STAR Labs, the newspaper byline has Iris’ name on it, she is still alive in 2024; the future is changing. Since Iris didn’t die, Barry doesn’t go down his dark path, he never creates the time remnants, and Savitar never exists. Barry tells Iris the time paradox will erase Savitar in a few hours. That still gives him time to try something new. They don’t know what Savitar’s new plan is, but it must entail Killer Frost and the Speed Force Bazooka. Julian (Tom Felton) walks in and has some good news, he and Caitlin’s mother have found a cure for her metahuman DNA. Wally (Keiynan Lonsdale) flashes in and informs the team that Savitar has Cisco. Cisco is thrilled to learn that Savitar’s plan failed. Cisco: “You better have a Plan B. Because I don’t think your Plan A worked out too well.” Savitar-Barry: “Fix this.” Cisco: “Fix what? The Speed Force Bazooka? I didn’t name it. If I didn’t name it, I didn’t make it. And I don’t know how it works.” Savitar-Barry: “You know enough about it to alter what it does.” Cisco: “You want me to alter it. What do you want me to alter it into? Like a hair dryer? Or a waffle maker? Oh, I know maybe something that’s going to fix that thin crust pizza you call a face.” Savitar-Barry does have a plan. He wants Cisco to turn the Speed Force Bazooka into an interdimensional time splicer. He’ll be able to fragment himself across time. He can rule throughout time. That’s why he let them live. He wanted Tracy to build it earlier and have Cisco make the adjustments. Savitar-Barry vibrates his hand; Cisco isn’t going to adjust it because Savitar-Barry is doing a ‘Reverse-Flash’ with the vibrating hand. Savitar-Barry tells him this is for Caitlin, he’ll kill her if he doesn’t do it, and oh by the way, Julian has found the cure for Caitlin. Barry and Iris talk alone. He tells her that anger has its place, but he thinks back on what Snart told him, be the hero all the way. Sometimes you can’t use force. He has to do something Savitar doesn’t expect. Barry meets with his time remnant. Barry tells him he wants to help him. He wants Savitar-Barry to come back to STAR Labs and let them help him live. He knows that deep beneath the pain is Barry Allen. Savitar-Barry remembers having family and friends. 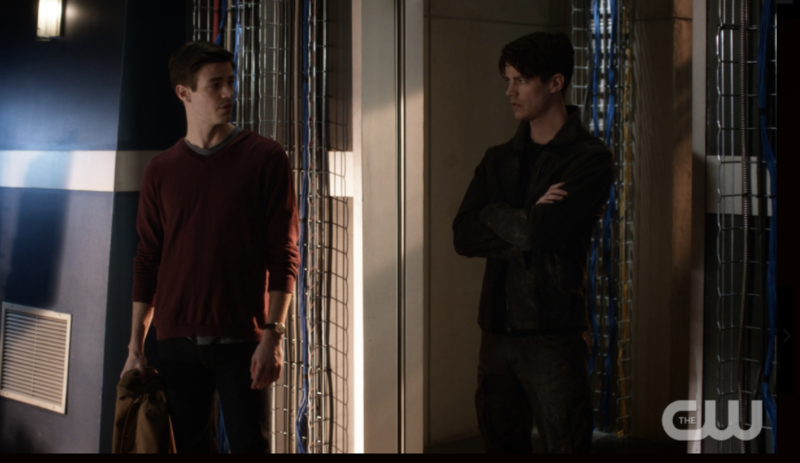 Barry makes Savitar-Barry remember a childhood memory of his when he was a six-year-old. The Allen’s were going to a science fair and got a flat tire, and their car was towed to a small town. Little Barry was disappointed about missing the science fair, but they had ice cream and saw a fireworks display. It is his favorite memory of his parents. He asks Savitar-Barry what was the name of that town, Savitar-Barry says, “Masonville.” He goes back to the lab with Barry. Joe and Julian are ready to jump him. Iris walks over to him and touches his face. He looks surprised. Tracy doesn’t want to help him. “He stole my future. Why does he deserve one?” When she is in her lab alone, they have Harry Wells speak to her. She is shocked because she thinks she is seeing H.R., but Harry explains whom he is. He tells her she has to help because H.R. gave his life to save these people because he loved them and her. Iris and Barry are alone with Savitar-Barry. They have a humorous moment with him. Savitar-Barry: “How do we explain me at the wedding? Do I sit bride-side or groom-side?” He looks at Iris and remarks that there is a fine line between love and hate; he remembers giving Iris the ring and singing to her. Iris tells him they are there for him. She asks him where are Caitlin and Cisco? He says he is going to get them and speeds out. A few moments later, the Philosopher Stone explodes, Wally gets everyone out but Iris, but Barry gets her. A beam of light heads straight to the sky. Going back to STAR Labs with Barry was a ruse. Savitar-Barry thinks he killed them all. Cisco tells Killer Frost Savitar-Barry will turn on her when he no longer needs her. Cisco is through with the Bazooka so he tells her to kill Cisco. Gypsy (Jessica Camacho) shows up and saves him. Cisco: “How did you vibe that I was in trouble?” Gypsy: “Because we’re connected. Jackass.” They jump through a portal into Iris and Barry’s apartment. At the park, Killer Frost and Savitar use the bazooka to open a portal. Savitar explains to her that the Speed Force doesn’t like it when the speedsters mess with time. The Black Flash comes charging out of the portal, heading straight towards Savitar. The Black Flash can’t deal with cold, so Killer Frost freezes him and he breaks into pieces. She snidely says, “Bye Hunter.” (Season two villain, Hunter Zolomon was turned into the Black Flash.) Killer Flash now uses the bazooka to begin Savitar’s ascension. Of course, Cisco didn’t turn it into an interdimensional time splicer; he turned it into a Speed Force skeleton key to free Jay Garrick (John Wesley Shipp). Team Flash is at H.R.’s funeral. Iris tells a story about John Lennon and a school assignment. The assignment was on ‘what do you want to be’. Lennon’s answer was ‘happy’. The teacher told Lennon he didn’t understand the assignment, Lennon told him he didn’t understand life. H.R. was happy; he understood life. H.R. wasn’t a genius or have superpowers, but he was a hero. They all say their goodbyes to him. Barry tells Cisco what H.R. told him before he died, “This took strength, and he [Cisco] gave it to me.” Caitlin is standing behind some trees. Barry, Cisco, and Julian go to her. Barry tells her H.R. would appreciate her coming to his funeral. Cisco jokes: “At least you’re not shopping at Villains-R-Us anymore.” They ask her to come back with them. She can’t, she isn’t Killer Frost, but she isn’t Caitlin either, she is someone new and she needs to find out who she is. She asks them to let her. Iris and Barry are back home relaxing. They can think about the wedding now. Barry delivers their ‘save the date’ cards. Their window breaks, they wonder if it’s an earthquake. They go outside and see it’s a lightning storm. They go back to STAR Labs and find out it is affecting the whole city. The storm will destroy the city. Since they broke Jay out of the Speed Force prison, someone else needs to take his place. Barry volunteers to go; after all, he caused all of this by creating Flashpoint. He explains to a crying Iris that it is his penance and his chance at redemption. Iris: “This city needs a Flash.” Barry: “They’ll have one.” He appoints Wally as the Flash, he asks him if he is ready and Wally quietly assures him he is. He asks Harry to stick around. A portal opens, and it is the Speed Force in the form of Nora Allen (Michelle Harrison). They tell the Speed Force Barry shouldn’t be punished. Speed Force: “Barry isn’t going to hell, but like all runners, he’s eventually reached his finish line. His race is over.” Barry gives his instructions to Cisco. Barry: “Don’t mess it up with her [Gypsy].” Cisco: “I’ll do my best.” Barry: “They’re all going to look to you now.” Cisco: “Not a hero like you.” Barry: “You’ve always been my hero.” Joe is devastated once again. Joe: “All this time we’re trying to save Iris, you’re telling me that we should have been trying to save you too.” Barry: “You did save me too…No son ever felt more love from a father.” Joe: “No father ever felt more proud of a son.” Barry and Iris have to say perhaps their last goodbyes. Iris: “This is unfair; we were supposed to have our happy ending.” Barry quietly: “I know.” Iris: “I wanted to be Iris West-Allen.” Barry: “And you’ll always will be. But you need to keep living your life. Keep growing, keep loving, keep running [he chuckles] keep running for me, promise you’ll run Iris.” They share their final kiss and Barry joins the Speed Force. He looks back at his family one last time and enters the Speed Force. Barry is gone and the storm is over. This has been an uneven season. The tone of the season was contrary to what the fans wanted. Instead of the optimistic, joyful show, we fell in love with in its first season, this season was gloomy and dark. There was still some humor but mostly the show was depressing. For the first part of the season, Cisco was angry with Barry for Flashpoint, and he kept sniping at him and acting sour. Julian was a prick. Caitlin was hiding her Meta powers. Wally was experiencing angst wanting to have speed powers. Iris and Joe had a beef with each other. Barry felt guilty for what he had done to his friends and family. When they started getting over that, they spent the rest of the season on Iris West’s impending death. Some episodes that felt like a parody of the R.E.M video, “Everybody Hurts”. To me, it felt like by the last few episodes of the season, the writers understood what was wrong and were trying to make sure that Barry Allen would return to being the hero we want, and need him to be. The episode had the action you would hope for a season finale. The final battle between Savitar and the three speedsters was exciting, and Barry vibrating into Savitar’s suit and kicking Savitar-Barry out of it was a series highlight. Most important though was how emotionally strong it was. The final scene was touching. When Barry got around to saying his final goodbyes to the two people he loves the most in the world, Joe and Iris, I felt a little misty myself. Grant Gustin is a fine actor and one of the things he does best are emotional scenes like these. Jesse L. Martin always hits the right notes in these scenes, and Candice Patton was their equal. The backbone of this show is the West family, and it is good they relied on them for the finale. I am still upset by the way they made Iris a secondary character in a storyline about her dying. I did enjoy that she was able to save Barry by shooting Savitar in the end, but I would have to call that too little, too late. I hope they will let her be more active in her storylines. I know the show is the Flash, but if it’s your storyline, you should be an active participant in it. I have had problems with the Killer Frost storyline, mainly, why is Caitlin evil, but I did like how they ended it for the season. Instead of her becoming Caitlin Snow again, they gave her agency and are allowing her to find out who she is now. She isn’t Killer Frost, but she isn’t Caitlin either. I’m interested in finding out next season who she is, and how they’ll use Danielle Panabaker in the show. It should create an interesting dynamic at STAR Labs. The episode was fun, exciting and heartbreaking at the end. The plot didn’t make sense at times, but I’m use to that on the Flash. As long as I’m entertained, I will allow it to an extent. It is like an athlete, the more you help me win, the more I’ll let you get away with. The episode gives me hope that the show will get back to its roots and be the show we all fell in love with.